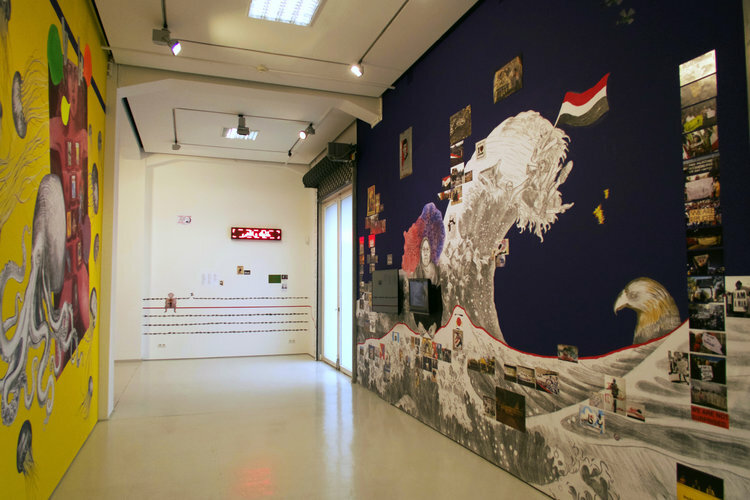 Be realistic, Ask for the Impossible: Lara Balad, Multimedia installation. Led ticker, video installations, murals. Affect Me. Social Media In Art, KAI10 | Arthena Foundation, Dusseldorf, Germany. Photo Alexandra Höner, 2017. The interview series poses questions concerning the role of affects and emotions in research practice and contemporary society to researches on short-term visit and associate members of the Collaborative Research Center „Affective Societies“. Today, we introduce Lara Baladi, an Egyptian-Lebanese multidisciplinary artist, archivist and educator. In her investigations into archives, personal histories, socio-political narratives and myths, Baladi’s work spans a wide range of mediums, photography—analogue and digital—collage, immersive video, sound and multi-media installations, architectural spaces, sculptures, tapestries and perfume. Since 2014, she has been a Fellow at MIT’s Open Documentary Lab. In 2015-16, she was the Ida Ely Rubin Artist in Residence at MIT’s Centre for Art, Science and Technology (CAST). Currently, she is a Lecturer in MIT’s Program in Art, Culture and Technology (ACT). Lara Baladi participated in the exhibition Affect Me!, jointly curated by Kerstin Schankweiler from the CRC 1171 at Freie Universität Berlin and Julia Höner from the gallery KAI10 | Arthena Foundation in Düsseldorf. The objective of my archive / artwork is an online interactive timeline of the 2011 Egyptian revolution. Through iconic images and archetypal moments, Tahrir Square is placed in parallel to many more global social movements. The significance of the project is to be a tribute to Tahrir Square, a tool for research and ultimately a platform for remembering History in the 21st century. Maya Deren’s film, ‘Meditation on Violence,’ focuses on the performance of a martial arts master. In spite of having been shot in 1948, it strongly resonates with today’s world. Since I visited the renowned Wagah border between Pakistan and India in 2010— defined in Wikipedia as “ alternatively a symbol of the two countries’ rivalry, as well as brotherhood and cooperation between the two nations,” I started thinking about the essence of conflict. The Wagah border in my view represents a contemporary ‘Mediation on Violence.’ Whether internal, personal, social or political, violence is an integral part of our lives. Deren’s film blurs the boundary between aggression and beauty, between violence and peace. My project, currently in the making, attempts to show this the rivalry and alternatively brotherhood, the essence of conflict.